Nyla Fujii-Babb, one of Hawaii’s premier storytellers, will be a featured performer for the 2015 HSPLS Children’s Summer Reading Program at nine selected public libraries statewide on the Big Island, Kauai, and Oahu from June 23 through July 11. Admission is free. “Aunty Nyla” will present “Hawaiian Heroes: Past and Present,” stories featuring Maui, Punia, Laka, Ikua Purdy, and Duke Kahanamoku. This 45-minute performance is suitable for all ages. Young children must be accompanied by a parent or caregiver. 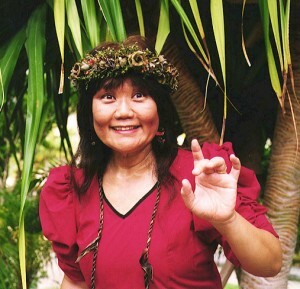 In addition to being a storyteller, Aunty Nyla has been an artistic director, puppeteer and actress for more than 20 years, and is a retired HSPLS Children’s Librarian. In this year’s Children’s Summer Reading Program theme “Every Hero Has a Story,” pre-kindergarteners through 6th graders are invited to discover the “superheroes” within themselves as they read and learn about real life, fantasy and everyday heroes among us who do extraordinary things! Weekly reading incentives will include items such as school supplies, tasty treats, and a Super Hero Activity Kit for young readers to assemble Super Library-Ann, Captain Read-A-Lot and a superhero of their own creation. Free lucky drawings will also be conducted at each library for a chance to win a Back-to-School Backpack filled with handy school supplies for registered children (two prize winners per library). The event schedule is subject to change. Contact the hosting library as soon as possible if a sign language interpreter or other special accommodation is needed. Sponsors for the 2015 HSPLS Summer Reading Programs include the Friends of the Library of Hawaii, Hawaii State Federal Credit Union, HEI Charitable Foundation, Meadow Gold Dairies, HMS Host, Hansen Distribution Group, DFS Hawaii, Roberts Hawaii, Toshiba Business Solutions, The Harry & Jeanette Weinberg Foundation, National Football League Charities, Aloha United Way, The Islander Group, First Hawaiian Bank and local Friends Chapters. Corporate sponsors include Hawaii Pizza Hut, McDonald’s Restaurants of Hawaii, First Insurance Company of Hawaii, HouseMart Ace Hardware and HouseMart Ben Franklin Crafts, HONOLULU Family, Frito-Lay of Hawaii, Starbucks Coffee Company, Wholesale Unlimited and Diamond Bakery. In addition, these programs are funded in part by the U.S. Institute of Museum and Library Services under the provisions of the Library Services and Technology Act, administered in Hawaii by the State Librarian. Performing artists from the Statewide Cultural Extension Program are co-sponsored by the University of Hawaii’s Outreach College, the Hawaii State Foundation on Culture and the Arts and the National Endowment for the Arts. For more information about the “Hawaiian Heroes: Past and Present” program or about the 2015 HSPLS Children’s, Teen, or Adult Summer Reading Programs, please visit www.librarieshawaii.org/summer… like us at www.facebook.com/HSPLSHIgov, follow us on www.twitter.com/HSPLSHIgov, or call the hosting library.